Dance is an art form that transcends cultures, languages and national boundaries. 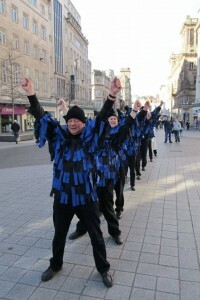 With that in mind and a thousand years of history behind us, Mersey Morris Men crossed the English Channel armed with just a name and an email address to meet with Les Gastadours Lamballe, a Breton dance group. We were accompanied by members of Mockbeggar Morris. After an introductory meeting with our hosts conducted in little bits of schoolboy French (although we weren’t able to get ‘my grandmother was run over by a steamroller’ into the conversation) we had an itinerary of sorts. A welcome by our hosts with crepes and cidre followed by visit to Le Val Andre, a seaside resort. Then a MerseyMorris first, a paramedic helicopter landing in the middle of our set. It started with boule and pallet, traditional French games followed by a typical Breton lunch of a mere 5 courses. Kir, pain du potage, a pork, sausage and beef stew served with cabbage, cheese, Far (Breton custard pie) all washed down with wine and/or cidre. Then we went to an English festival in Moncontour, a beautiful fortified small city set on hill overlooking the beautiful Breton countryside. A representative of the mayor gave us a tour. Then the main event. A display by Mersey in the town square to mix of curious locals and tourists. Amazingly they stayed to watch all afternoon. They were taught a simplified version of the Shepherds Hey jig and Greenbanks, a Mersey stick dance. Then we were joined by Les Gastadours Lamballe for a Danse Spectacleur. 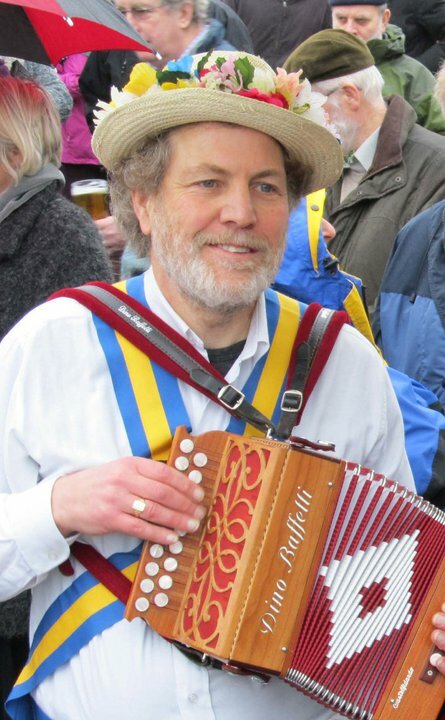 Finally, Bonny Green Garters was performed by all that were willing including an old school friend of the Squire, who was a member of Jockey Morris but had moved to Brittany 35 years ago. The day was completed by a visit to an evening festival in a vineyard listening a variety of Celtic music groups and a Pink Floyd tribute act whilst eating Gallettes Saucisson (sausage pancakes) and the local wine. A visit to a Bread and Threshing Fair at Pleuganast. Again we were fed with the local cuisine and performed 2 spots. This was made more interesting to locals by a gaggle of geese being herded through the set by a dog. There was also an impromptu session of dad dancing, enough said. This was a day off performing, so we thought, with a visit to the medieval town of Diann as tourists. Then in the evening was a Conviviale. Another belly busting feast of local produce. Performances by both both sides including Breton social dancing, a massed jig including Alain, one of our hosts. He has been signed up as an overseas member. Finally an obligatory Scouse song, Lily the Pink. We met through a name and an email address and parted as good friends. Some might say sending a bunch of Scousers onto mainland Europe would accelerate Brexit negotiations, but we have endeared ourselves to our hosts and their friends through the medium of dance and our ‘Last of the Summer Wine’ sense of fun. We are already planning to host out new friends next year. And so continuing my mid-term review bringing us into 2015 , and the pebbles continued to make splashes…. 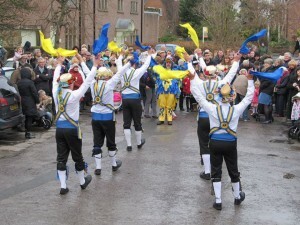 Mersey has a repertoire of Border and Molly dances which have been seldom danced in recent years. So a date was set for a winter dance out featuring only dances from those traditions. And the early 2015 practices were organised to focus on those dances. When one of our musicians kindly offered to make rag coats for everyone, it all came together. Border & Molly traditions are firmly back in the MMM 2015 programme , with rag coats at the ready for a quick kit change. The 2015 MM Cotswold dance repertoire was given a spring clean. Some of the feedback from 2014 was that there were too many easy dances, and perhaps not enough challenges for the more confident dancers. So in collaboration with the Foreman, all of those easy/default dances are being ‘rested’ for 2015 (at least) and have been substituted with other dances which had been languishing in the backwaters of the MM dance list. Interestingly when the new Ring Squire published his list of dances for ‘massed dances’, almost every one was already on that Mersey list of ‘rested’ dances!! 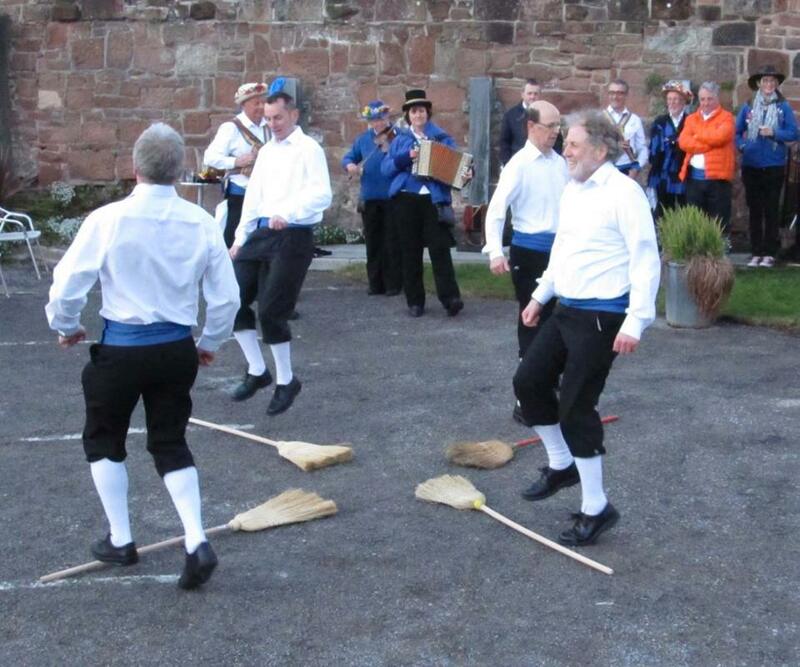 Following the positive response to the re-introduction of jigs last year, Peter Morris ran a workshop to teach the ‘Mersey’ Broom Dance, which he was taught decades ago by another Mersey man. As the 2015 dance season gets underway, three broom dancers have already demonstrated their skills in public, with at least two more training their brooms in eager anticipation. This August, we are hosting Adelaide Morris Men for a weekend. 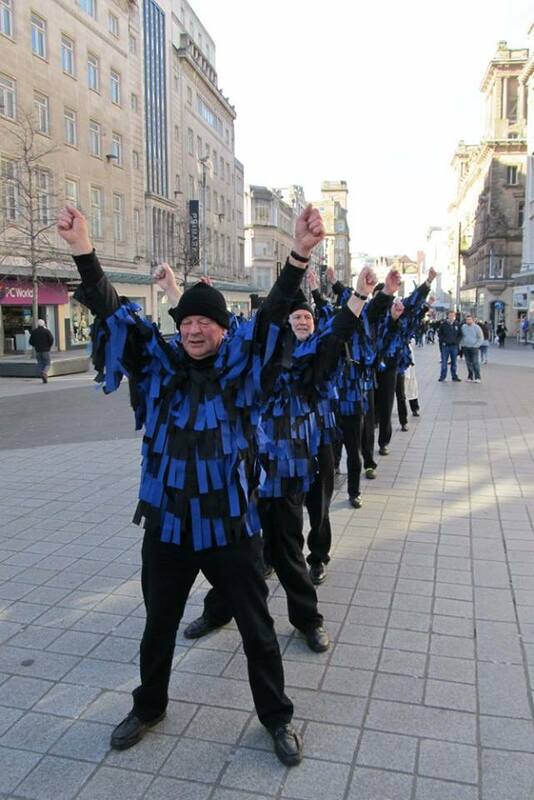 We are therefore running a one-day Meeting of the Morris Ring in Liverpool on the Saturday, followed by a more leisurely dance out in Chester the following day. Finally to round these mid-term musing off with news to excite every morris team – three new dancers have joined MMM (although one had danced with us twenty years previously) and two new musicians, including our first piper. The dance goes on for MMM ……. and there are still some pebbles left!!! Suddenly it is May 2015, where did those last 12 months go? It is said the road to ruin is paved with good intentions. 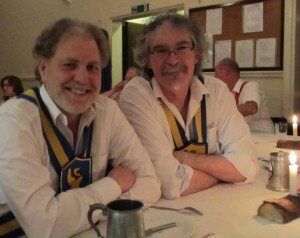 As I approach the halfway point of my three year sentence as Squire, what has happened at Mersey Morris? Looking back on 2014, there was plenty of dancing with lots of photographic evidence on our Facebook Page to prove it!! And some of those ‘manifesto’ pebbles I dropped into the Mersey did begin to generate waves…..
A new Liver Bird ‘Lennon’ bonded itself to the team, and having grown up alongside morris men, he was at ease with the dancers, the music and the audience and regularly participated in dances. (This was a significant change to some of the previous generations of Birds which had been decidedly irritable.) Very popular with the audience, especially the children, he is now an asset to the team. Jigs became an integral part of the Mersey performance repertoire. Almost every member of Mersey danced out at least one jig over the summer from across a wide range of traditions including a ‘free form’ Adderbury jig. Although they were usually performed in pairs rather than solo, on one occasion the whole team danced Nutting Girl from Fieldtown ‘en masse’. Boxing Day is our major ‘home’ performance of the year with typically a few hundred people turning out, whatever the weather. For 2014, we re-discovered the Mersey Christmas dances – largely traditional Cotswold dances to Christmas carols. These hadn’t been danced this century and so gave everyone something different to practice! Reality Strikes and the 2014 Summer Challenge! We have gone speeding past the end of January and I realise I have now been officially ‘in post’ as Squire of MMM for almost a month, since the MMM AGM in early January. At the AGM, there were no last minute electoral shenanigans, due process was observed and Squire regeneration took place painlessly. The Squire’s tankard, freshly engraved with my name below the names of those that have held the office before me, starting with Ken Winter in 1959. And for my baldricks? The Squire’s badge which has the normal blue and yellow colours reversed. Great for those ‘spot the difference’ competitions! Then, the grim reality of my predicament began to sink in. When you are a ‘normal’ member of a morris team, whether dancer or musician, you can turn up to practices and events, and just wait for something to happen, because someone will tell you what to do. Apparently that life of being a ‘passenger’ is behind me for the next three years! People are waiting for someone to tell them what’s happening, and then looking at me to do it!! Luckily, during the practice season, Richard our Foreman is actually the one to be obeyed. With our dance season kicking off with Devil’s Dyke Ring Meeting in early April, my first intellectual challenge as Squire will be creating a mental matrix of our dance repertoire – easy/intermediate/challenging + hankie/stick + regularly danced/never practised etc, and mapping the varying abilities of our team of dancers and musicians on to it. I can see without that picture, it is difficult to build a sensible dance set list for any specific event with the dancers available. And I applaud those that have done it before me!! This year, jigs were introduced as an integral part of every Monday night practice for the first time since I’ve been a member of Mersey MM. This has given members of all abilities an opportunity to have a go at a jig from each of our main Cotswold traditions – Fieldtown, Bampton, Headington, Bleddington and Sherborne. 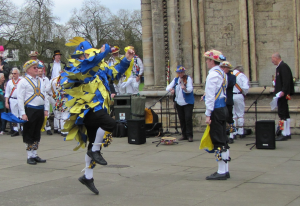 More recently, four of us attended the excellent Jigs Instructional organised by The Morris Ring to be immersed in dancing morris jigs from multiple traditions for a complete weekend – knackering and totally mind numbing! As part of this re-introduction of jigs back into the wilds of the Wirral, I decided that jigs should form an integral part of our performance repertoire this summer, and that this dance ‘burden’ ought to be shared by as many as possible(!) rather than by just 2 or 3 long-standing members as has happened in the past. And so to make things easier, jigs will not only be performed solo but in twos or threes. Squire of Mersey Morris to Regenerate…….. Almost exactly eight years after turning up to Mersey Morris for the first time one dismal Monday evening in November, I find myself just eight weeks away from taking over the reins as Squire of the team for the next three years! Do they know what they have done!!!!???? Over the past few years, my webmaster duties have helped MMM become much more visible on the Internet, both through this website and through the social media delights of Facebook, and more recently Twitter. My constant request has been and still is ‘we need more content for the web’, so I thought it only right to finally commit to take my own medicine and post some occasional thoughts and observations as I crawl up the learning curve associated with wearing the badge of Squire of Mersey Morris Men. And perhaps shed some insights into the machinations of ‘the Morris’ along the way. AGM minus 8 weeks and counting…regeneration beckons…. Having won the recent by-election at a General Meeting, I officially take over as Squire following a formal vote at the MMM AGM in early January. Until then, I am Squire Elect, waiting in the wings, making helpful suggestions, and generally getting in the way. One of the benefits of going through an election process is that it did cause me to think about what I would actually like to do, to achieve, to introduce, to change, to improve, to leave untouched, to get rid of etc etc during my time as squire. And also meant I could potentially start to get some wheels turning before the official handover! 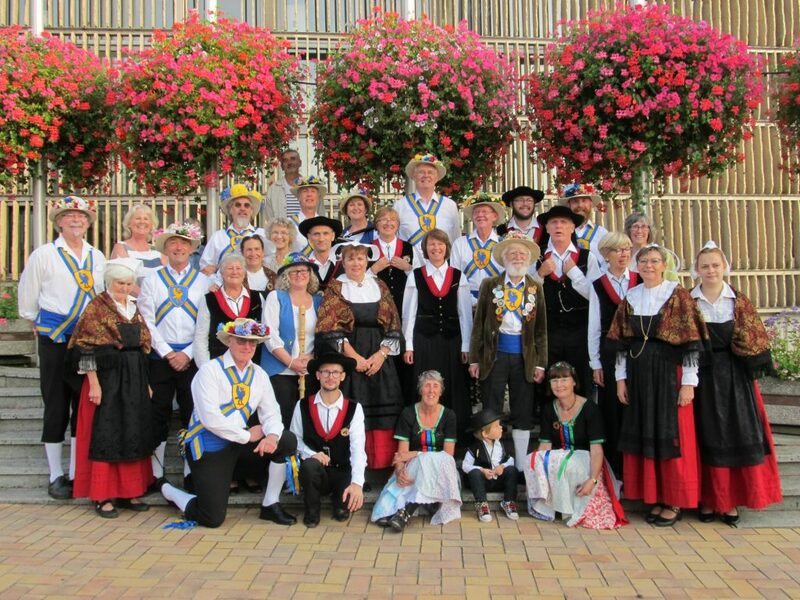 As an example, MMM enjoy the company of other Morris teams and each year travel widely (yes, Australia!!) to Ring Meetings and other teams’ Days or Weekends of Dance. 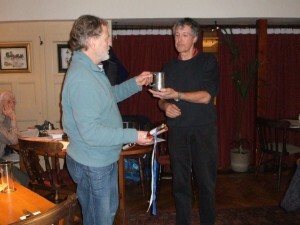 But we do not regularly hold our own event to return the invitation! So yesterday evening, I flew the kite – “Do we want to organise our own event next summer?” – And the strong consensus was Yes!! Bus tour or walking tour? 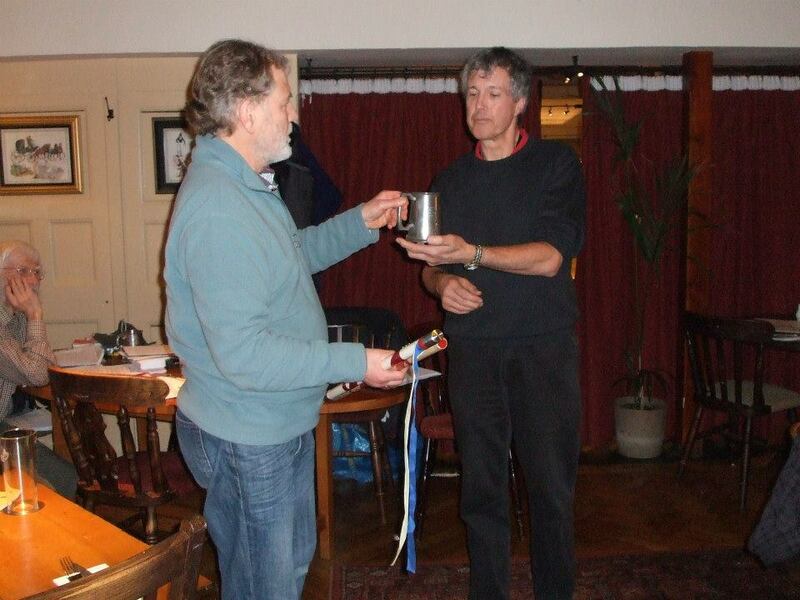 …..and who is going to help the committee make it all happen? But all of that is definitely for a future blog post or three! 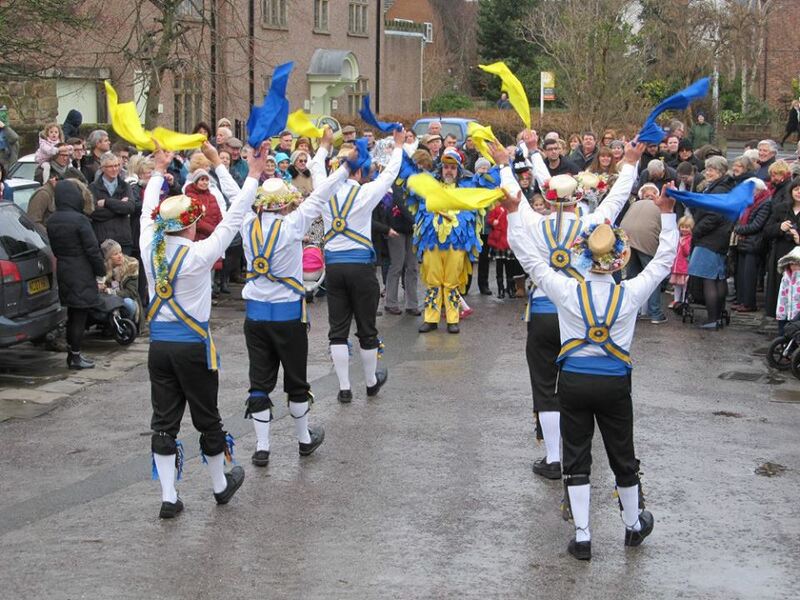 Before then I will undoubtedly be involved in meetings to decide next year’s dancing calendar and the choreography for our big event of the year – MMM Boxing Day Revels in Willaston, where the locals turn up in force to enjoy the dancing, mulled wine and cake. And finally, just in case you were wondering, I am Andy Wooles! 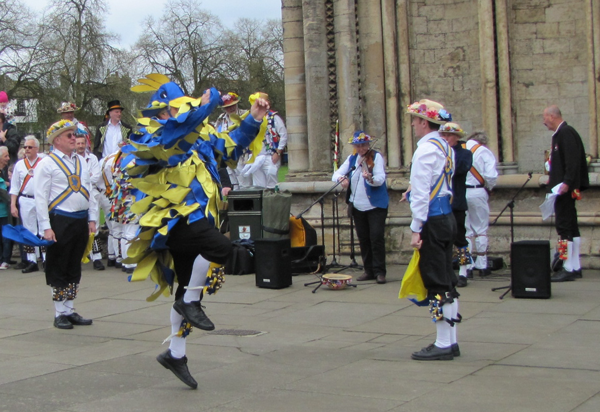 PS Does anyone have a job description for squire of a morris team?